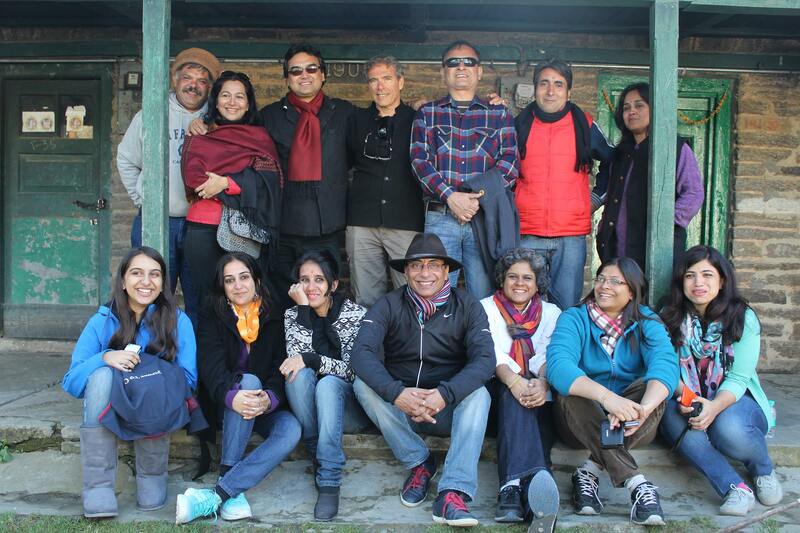 Last week, a group of writers and I were part of the Te Aroha Literature Studio Writer’s Retreat in Dhanachuli, near Mukteshwar. There will be more written about the discussions and the learnings from that retreat eventually, but because I am dead lining right now on something that must be submitted in a couple of days, I leave you with this. Some photographs of the lovely venue and the interesting and wonderful mix of folks that were part of this retreat. I must add, a huge thank you to Sumant Batra, the committed patron of the arts who hosted this fabulous retreat at his wonderful luxury boutique hotel Te Aroha, to Vibha Malhotra, vibrant and passionate about writing and literature, the founder of Literature Studio, who kindly invited me to be part of this retreat. Also to Dr Sakshi Chanana for moderating the lovely panel discussion I was part of, on Social Media and the writer, a topic I have been grappling with for yonks and coming sadly, to no acceptable decision. Among my fellow participants, I was honoured to meet stalwarts like Amir Or, Sudeep Sen and Geet Chaturvedi who introduced me to the magical beauty of poetry read aloud, something I had sadly been oblivious to in all these years of reading some poetry (not too much, I must confess). Rashmi Nambiar, who made me realise that the power of a story read with emotion can churn your heart up and dissolve it into tears, Supriya Dhaliwal, for her wonderful confidence and overwhelming maturity in her poetry, Maulshri Shukla Rajdhan for her powerful poetry and prose that provoked, disturbed and moved one, Kulpreet Yadav for the commitment and dedication he brought to his writing which was most inspiring given the slacker I am when it comes to pushing self and work, Vijay Datta for his love for poetry and the depth he brought to the discussions, Vineetha Mokkil for proof that short stories do have a market, despite all they tell us, Saritha Rao for the sheer joie de vivre she brought to the gathering and the wonderful documentation of the retreat through her new camera, Chef Michael Swamy and Mugdha Savkar for inspiring me with the passion they bring to food and photography, my family might just suffer from the results of some experiments I do in the kitchen now. I went unknowing what lay before me. I returned a richer person, enriched with new friendships, with new perspectives. And yes, the announcement that we will now have a Kumaon Literary Festival next year, at the same venue, a decision that arose from the discussions and debates through the retreat, a discussion that spoke of the need to have a literary festival that was far removed from what literary festivals have now come to stand for. 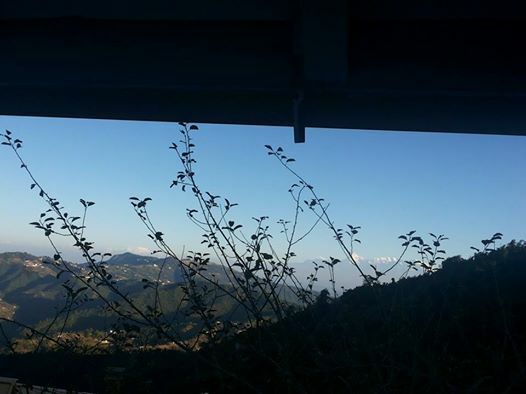 November 2015 is when the Kumaon Literary Festival will happen. More details on the Te Aroha page linked to at the end of this post. The blog has seen a hiatus of sorts for quite sometime, a little intentional, a little because I really had nothing to say and was all out of words and needed to catch my breath a bit and get my words back, and because, well, honestly, I was getting a trifle bored with blogging. Been there, done that, worn the t-shirt. Today, I felt I had something to say and decided, by God, I would say it. I have been saying this in bits and pieces, but today is going to be an all out, guns at dawn kind of effort. The Clean India Swach Bharat movement launched today. In troth, I am delighted. I am all for it. I hope it goes beyond the hyperbole and the photo ops and infiltrates down into our consiousness as citizens of our country that we and only we can keep our surroundings clean, and for that first, we must take pride in our surroundings. And by extension, we must treat our surroundings and our country the way we treat our homes, by being fastidious about keeping it clean. As a swim parent, I accompany the offspring to many a swim meet and find that the culture of littering is all pervasive. Parents will lovingly feed their child a banana and casually drop the peel down to the floor next to them. Carboplus will be given to their offspring to help them with that extra boost of energy before a race, and the empty tetrapacks discarded on the ground. Boiled eggs shelled and fed, with the shells tossed casually into a corner. One memorable moment was when I actually told a parent sitting in front of me creating a person high pile of litter next to her to cease and desist and got told to mind my own business or clean it up myself if I was so concerned. And this lady was togged out with Gucci bag and Chanel sunglasses. Another time I told a boy, who was casually throwing the wrappers of everything he was ingesting on the floor at a swim meet to pick himself up and take it to the dustbin few steps away, and was told clearly, “That is not my job, that is the cleaner’s job.” This is a boy who is driven around in a BMW. How do you teach children not to litter when they learn that cleaning up is not their job. That they are not responsible for the cleanliness of the space around them. That it is demeaning to them to clean up behind them. How do you tell a grown adult that he or she must not litter? That littering reveals how narrow their minds are. That public calling out for their littering a public space means nothing to them, because there are no serious ramifications for littering–no steep fines unlike other countries, where they behave and keep their litter to themselves because they know that they will be hauled up if they do. There is no shame in cleaning up after oneself. There is no shame in telling someone to pick up their litter. But there is shame in being a people who donot care about their surroundings and are willing to live in filthy surroundings because they will not speak out, or will not maintain basic civic sense. That is what we need to clean up first, the mindset, the mindset of indifference to our surroundings, the lack of a sense of ownership of public spaces, the attitude that makes us believe we demean ourselves if we pick up litter. That is what needs the broom. 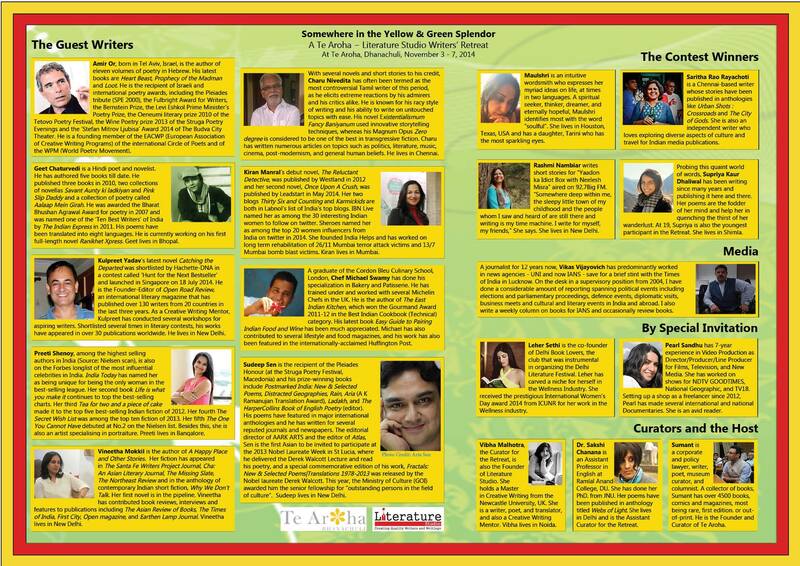 Some weeks ago, the very wonderful Anaggh Desai (@anaggh on twitter and the God of all he surveys on social media) sent across a mail inviting me to be part of a discussion on Influencers at Social Media Week, Mumbai. 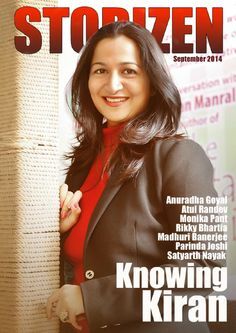 When Anaggh commands, you dare not say no, arey how can I, my tongue ties itself into knots on a stage, and do you know I was the one who always got chucked out after every GD when I was trying to get into the corporate world because I would feel terrified to jump into the discussion, etc. But, to cut a long story short, I said I would be there, hair in a braid, etc, and so I presented myself, duly spit polished on the appointed date at the appointed time. 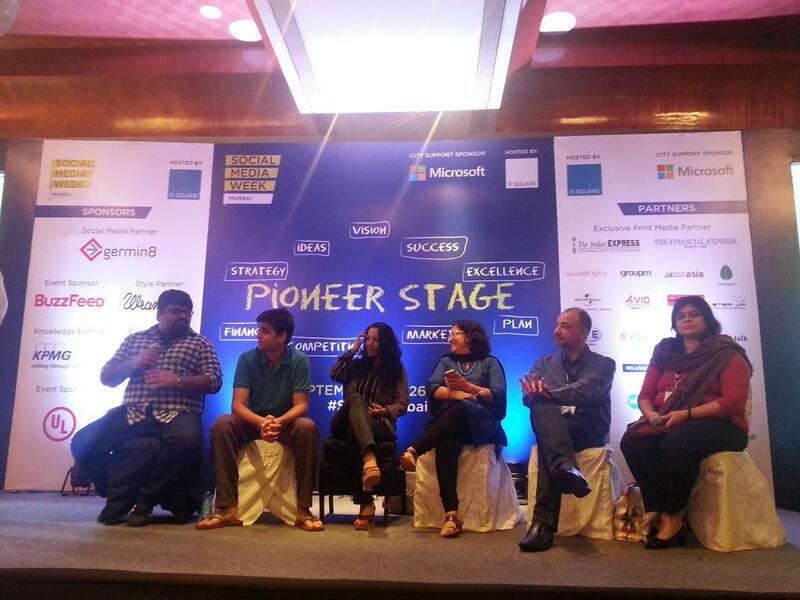 With me on the panel, which was being moderated by Anaggh, were some of the most popular names on social media, Rohan Joshi of All India Bakchod, Rushina Munshaw Ghildiyal and Food Blogger, dear friend and the owner of the APB Cook Studio, Deepali Naair from Mahindra Holidays who serendipitously turned out to be an old acquaintance from my days as one who earned my keep as a paid employee at a media house, Karthik Srinivasan or @beastoftraal on twitter who is with Ogilvy and Dharmesh Gandhi from Star. It was a very interesting discussion. To start with, I learnt there are rate cards for tweets, and ‘influential tweeters” have set rate cards. Clearly I am not one of those, because I’ve been pretty much babe in the woods regarding this, and no one has offered me money to tweet yet. A gift voucher for Rs 500 has been the most tempting offer I have received so far. And one that offered me conveyance to attend a restaurant tasting. Sigh. I’ve also learnt that folks buy followers, and there are agencies that can buy you the desired number of followers on twitter. It has been a harsh cracking of the rose tinted lenses. Here’s my take on the entire influencer debate. To start with, I don’t think I am one. Having got that out of the way, I think the only true influencers in this country are Bollywood superstars and cricket stars. And you can only influence someone if you have some credibility with that person, and this credibility does not come across if they don’t have some sort of connection with you. I do, however, have fun conversations on twitter occasionally, something I have consciously cut down on recently, having deleted both twitter and facebook from my phone, because seriously, there is a need to start withdrawing before one begins living one’s entire life on social media. And I had begun spending too much time than was mandated on social media. I have used this ability to generate conversations, rather shamelessly I might say, to promote my books online. But then I am but a gareebz author and must make use of whatever promotional tools are available to me. I have also used twitter and facebook and blogs and other social media networks to further Child Sexual Abuse Awareness and Violence Against Women Awareness. One of the initiatives that is very dear to me, India Helps, did come through a blog and a group of volunteers who connected online. I have no qualms absolutely about using social networks for all of these. The trouble began when I began receiving mails from PR agencies for everything from fashion to sanitary ware to technology to industry body releases. I realised I’d gotten onto some list, and ergo, was being bombarded with mails that wanted me to write/tweet about their clients. If it was something of interest, I still might. But sanitary ware? Industry body releases? And frankly, the tone of some of the mails irked me. They came with an assumption that I would jump through hoops for them. I have spent a lot of time replying to mails asking people to take me off their mailing lists. My inbox is calmer and so am I now that I am not bursting a blood vessel every time I open mails. I see folks running contests on twitter, and I have no issues with them doing so at all, at the end of the day there is no harm in earning an income and if they remain interesting tweeters I continue following them. If I feel that their feed is all about contests and promotions, I might just unfollow. And that is what every person who runs these promotions risks, me included, when I promote my books. There is always the unfollow button. No gun to anyone’s head to continue following. I appreciate a honest disclaimer if a brand is paying one to promote them, and I’m suspicious of tweets randomly promoting a brand. But, as I said, earning an income is no crime. And there’s always the unfollow button. I’ve tried to keep my blogs, tweets and commercial work separate. I did have a blog where I wrote about beauty products. I was honest enough to put a disclaimer that I had received the sample for trial from the PR agencies and was clear that I would write what I believed about the product. I’ve since discontinued reviewing beauty products for reasons I will not get into here, but suffice to say I’m not missing it. I write a blog for a biscuit brand, but it is a separate blog altogether from mine own. I have had fun blogging. I’ve taken a brief break because it wasn’t fun anymore. I will return eventually, I’m sure. And at the end, that is all that matters to me. Having fun while tweeting and blogging, and not really worrying about what label gets tacked onto one. Here is a picture from the event. 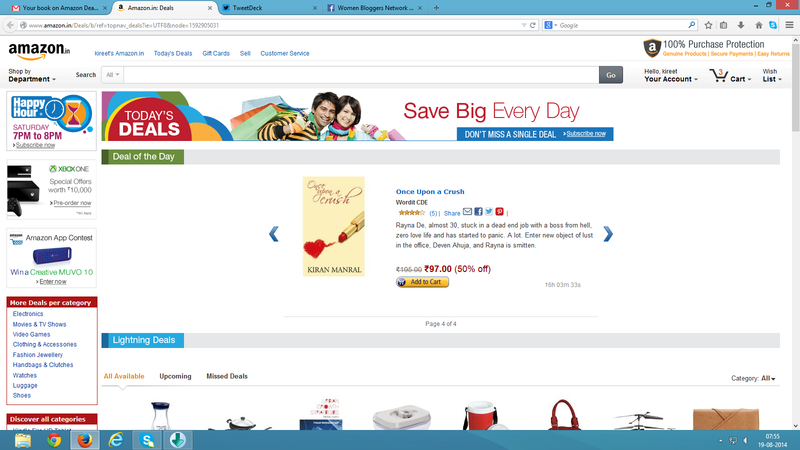 My second novel, Once Upon A Crush, is Amazon India’s Deal of the Day just for today at Rs 97 for the paperback and Rs 59 for the Kindle. The book is a fun read, and here’s what folks have to say about it and my writing.